The Koolatron 20 bottle wine cooler combines elegant design with state-of-the-art thermoelectric cooling technology.. This high performance wine cellar also boasts a tempered mirror glass doors and soft interior lighting, making it a great show piece in any room. The removable shelves also accommodate large or irregular sized bottles, or up to 20 regular sized 750 ml (25 oz) wine bottles. Getting ready for a big party? Be host with the most with all your favourite wines pre-chilled to the perfect temperature and ready to enjoy. The Koolatron 20 bottle wine cooler boasts a larger capacity dual thermoelectric unit for improved cooling performance. The digital touch controls and LED display lets you adjust the temperature of the cooling chamber so that all your vintages are stored at the perfect temperature. For best results set-up your wine cellar in the coolest area of the room, away from heat producing appliances, and out of direct sunlight. The Koolatron 12 Bottle Deluxe Wine Cellar features double tempered glass doors, wooden shelves and soft interior lighting. This compact wine cooler uses a thermoelectric cooling unit, so there is no vibration to disturb the sediment in your fine wines. The digital temperature controls allow you to set the desired cooling level for your wines. For best performance, leave a 5"clearance around the back, sides and top of any free-standing wine cellar. Koolatron wine coolers create the ideal cooling and storing conditions for any kind of wine. The temperature, humidity control, and stability are what put it above both the refrigerator and a wine cellar. Your kitchen fridge is likely too cold to create the correct wine storage climate. Koolatron wine coolers offer the convenience of being able to store your wine in one dedicated spot that can fit anywhere from a kitchen counter to a home bar. Maxx Cold X-Series MXCR65B 65" Commercial Horizontal Bottle Cooler is an excellent option for keeping bottled beverages cold and accessible. The spacious aluminum interior houses a LED light to illuminate the inside, which is especially convenient in dark operating environments. A built-in bottle opener and bottle cap catcher make this unit fully functional in high volume operations, while a reinforced heavy duty crossbar allows it to withstand the harshest conditions. Coca-Cola 25L Display Fridge Perfect for the home, office, games room or dorm room, the countertop Coca Cola Display Beverage Cooler is the must-have for any Coca Cola fan. 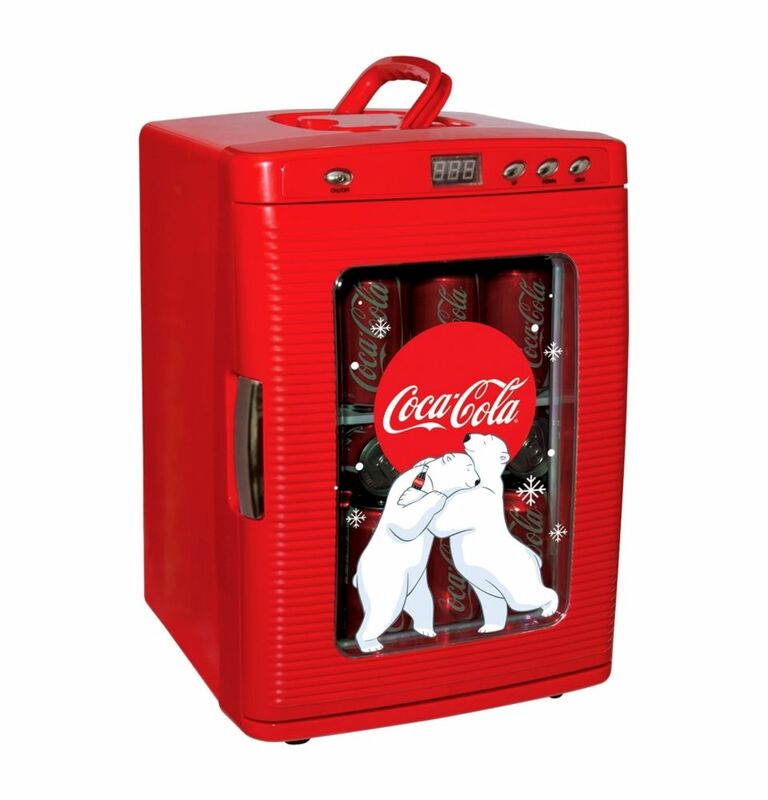 It features the iconic Coca Cola polar bear design and has a large capacity that fits up to 28 standard cans. This mini fridge comes with 12 volt DC and 110 volt AC plug, so you can power it from any household outlet or plug it into any vehicle 12 volt plug. The Coca Cola Display Beverage Cooler uses thermoelectric technology to cool your food and drinks up to 35F (19 C) below the surrounding temperature. Thermoelectric cooling is efficient and operates without any noisy compressors. Use it in HEAT mode to keep pre-cooked food or drinks warm. Heat mode will warm the contents up to 140 F. This beverage display fridge also features simple, front access LED controls so you can adjust and view the fridge's internal temperature with ease. Use the interior light to create a special display effect. Coca-Cola 25L Display Fridge is rated 2.0 out of 5 by 5. Rated 1 out of 5 by chainsaww from looks good, does not cool but a few degres in 3 days running looks great. cools very poorly.110 volt transformer in cord gets very hot. window tinting i think is too dark. Rated 2 out of 5 by mimi from ooops It's so cute, though it stopped working after 3 weeks. We are trying another, with fingers crossed! Rated 1 out of 5 by John from Does not work! When i got it it looked good. The quality was ok but it was good looking. The front door was plastic which was fine. There were basically no instructions in the manual and when i called Koolatron nobody answered or got back to me. The fridge did not work or turn on so i returned it. Rated 1 out of 5 by hottstuff from Looks nice.. I loved the way it looks. I plugged it in and let it run for 48 hours. I had it set to 2c which is ideal for cool cans of Coca Cola. But the lowest it would cool was to 11c. Thats comes out to about 53 f. I don't know about you, but I like my drinks cold. Dont know if this is just one bad one. But is doesn't do it for me. I called Home Depot and they were really nice. Told me to take it back to any store and my money would be refunded. Great service. But this is not a good product..